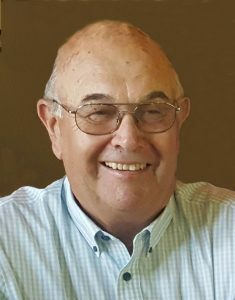 Donald Romshek, 75, of Bellwood, died Tuesday, September 4, 2018, at Bryan LGH. Mass of Christian Burial Friday, September 7, 2018 10:00 A.M.
Donald Romshek was born July 5, 1943, on the family farm near Bellwood, to George and Minnie (Smith) Romshek. He graduated from David City High School and served in the United States Army Reserves for 6 years. On February 5, 1966, he married Mary Ann Andel at Appleton. They lived and farmed near Bellwood and Don lived in the house where he was born his entire life. Don was a lifelong farmer, a life member of the church and was very active in the Bellwood community serving on the Church Board, as a Lector at his church, the Bellwood Legion, Bellwood School Board, Bellwood Coop Board and was a proud member of "The Bunch", a local group of good friends, for over 50 years. After retiring he loved to mow the yard at home and the cabin, have coffee with friends and visit his brother Charles in David City. He enjoyed Husker football and following all sports in which his grandchildren participated. Spending time at the cabin with family was among his favorite pastimes. Don is survived by his wife, Mary Ann of Bellwood, children, Mary Veskrna of Bellwood, Tony (Dani) Romshek of Shelby, Greg (Michelle) Romshek of Bellwood, Peggy Romshek of North Platte, Wendy (Trent) Sliva, Gretna and Stephanie (John) Donovan of Columbus. Also surviving are his brother Charles Romshek of David City and sister, Katherine Hodson of Manford, Oklahoma, 15 grandchildren; Jake, Kurt and Hannah Veskrna, Grant, Gavin and Grady Romshek, Kirsten, Emma, Chase and Brett Romshek, Bryce, Brenna and Brody Sliva, Noah and Nathan Donovan, and one great-grandchild, Benton Veskrna. He was preceded in death by his parents, brother George, sister Doris Meier, son-in-law Kelly Veskrna, two sisters-in-law; Margaret Romshek and Dorothy Romshek and four brothers-in-law; Gene Schmit, Don Hampton and Glenn Hodson and Art Meier.